Which HD Security Cameras are Compatible with My DVR Surveillance System? 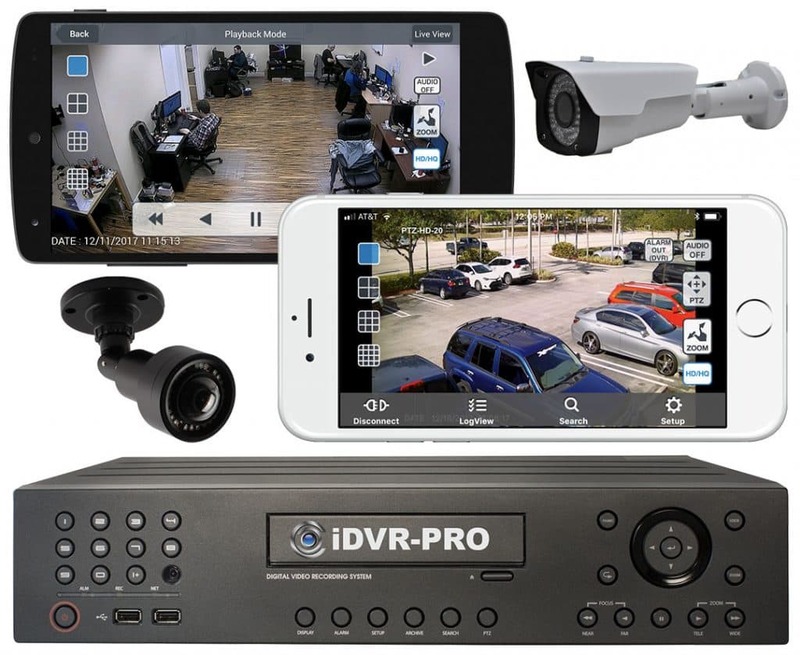 At CCTV Camera Pros, we often get asked if our HD security cameras are compatible with an existing DVR surveillance system from another manufacturer. With so many HD video standards and resolutions available, it can be confusing. This article is going to discusses camera, DVR, cable, and accessory compatibility for HD over coax type surveillance systems (HD CCTV). This article will not cover network IP cameras or traditional analog CCTV cameras (non-HD). Here are some typical questions that I am asked in regards to compatibility. If you have questions about specifically about Swann, you may want to checkout our Swann DVR Camera Compatibility Guide. I hope that this guide will help you determine the type of equipment that you need. If you still have questions or would like help determining the best equipment, please contact me at mike@cctvcamerapros.net. All of the large security equipment manufacturers (including Swann, Samsung, Night Owl, Lorex, QSee, Defender) sell HD over coax security camera systems. The problem is that many times these manufacturers do not disclose which HD technology their cameras and DVRs use. I suspect that this because they do not want their customers to have choices of where to buy replacement cameras and other compatible equipment. These are 4 major HD video formats used today. AHD cameras – Analog High Definition. Available in 720p, 1080p, 3 megapixel, 5 megapixel security camera resolutions. HD-TVI cameras – High Definition Transport Video Interface. Available in 720p, 1080p, 3 megapixel, 5 megapixel, and 8 megapixel / 4K resolutions. HDCVI cameras – High Definition Composite Video Interface. Available in 720p, 1080p, 3 megapixel, 5 megapixel, and 8 megapixel / 4K resolutions. HD-SDI cameras – High Definition Serial Digital Interface. Available in 720p and 1080p resolutions. Has been replaced over time by AHD, HD-TVI, and HDCVI. 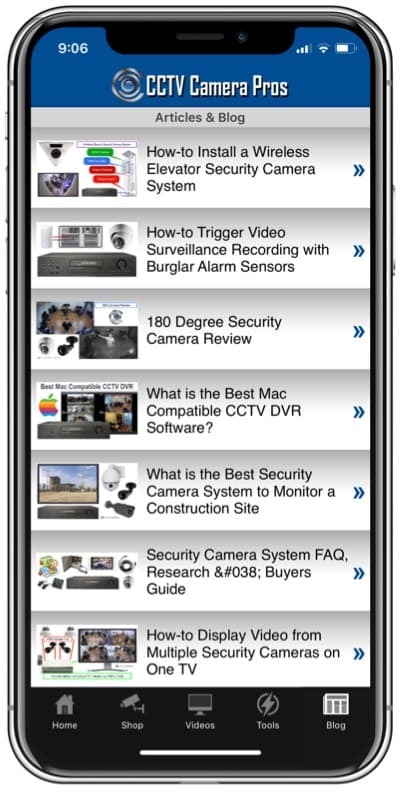 You can use the above links to the cameras that CCTV Camera Pros supplies for each type. If you are unsure of which video format your DVR supports and are not getting any help from the manufacturer’s technical support, please contact me here for help. My team can usually figure it out. Please note that typically if a DVR supports a higher resolution, it also supports the lower resolution but that is not guaranteed. For example, a hybrid AHD DVR that supports 1080p cameras most likely also supports 720p cameras. Just because you have a DVR that works with the 1080p cameras that it came with does not mean that you can buy any type 1080p security camera and it will work. It is typical for a DVR to support only one of the above mentioned video formats. There are also hybrid DVRs available that support more than one video format. For example, these iDVR-PRO DVRs support traditional analog CCTV, 1080p AHD, and 1080p HD-TVI cameras. If you are not sure which video format your DVR supports, please email me the manufacturer name and model. I will help. Most pre-packaged surveillance systems that are sold at big-box retailers like Best Buy, Walmart, and Costco include pre-made camera cables. Typically these cables are around 50 feet long each. Many installations will require longer cables that these. Here are some pre-made HD security camera cables in 25, 50, 65, 75, 100, 132, and 165 foot lengths. These work with AHD, HD-TVI, HDCVI, and HD-SDI cameras. You can also use a double female BNC connector to chain two of more cables together, however, I do not recommend trying to use pre-made cables for cable runs longer than 250 feet. For runs longer than 250 feet, you must use RG59 Siamese cable. If you want to cut cable to the exact length that you need or you need to run cable longer than 250 feet, you can use a spool of RG59 Siamese cable instead. 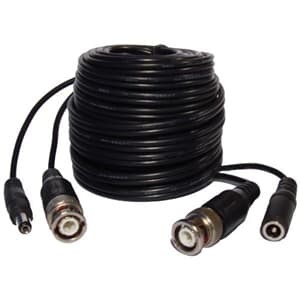 75 Ohm RG59 coax is compatible with all HD over coax security camera standards. Be sure that you get a high quality RG59 that is made for CCTV camera installations. RG59 spools require that you cut the cable and attach BNC connectors for video and power plugs for the 18/2 power cable. This page has has spools of RG59 and kits that include tools and connectors. There are also videos on that page that show how-to cut and crimp cable. The maximum distance that RG59 cable can be run for HD security cameras varies depending on the type of camera and resolution you are using. For example, RG59 cable can be run up to about 1000 feet for 1080p resolution AHD and HDCVI cameras. RG59 can be run for 1080p HD-TVI video up to about 1600 feet. You can find a more complete max distance cable guide for HD security cameras here. Video amplifiers allow video signal to be boosted 5000 feet and more in some cases. Video splitters let you send the video signal to from a security camera to multiple devices. For example, if you want to connect a single camera to both a DVR and monitor, you can use a splitter. You can find video amplifiers and splitters for all major HD camera types here. Want to display live video from your security camera on a TV? You need to convert the video signal to HDMI in order to do so. You can learn more about BNC to HDMI converters here. This page contains HDMI converters for AHD, HD-TVI, HDCVI, and HD-SDI security cameras. I hope this article helps guide customers looking for surveillance equipment that is compatible with their HD camera system. Most of my company’s competition does not try to make it easy and I realize there is a lot of technical information to analyze. If you have any questions, I am here to help. Please contact me at mike@cctvcamerapros.net.